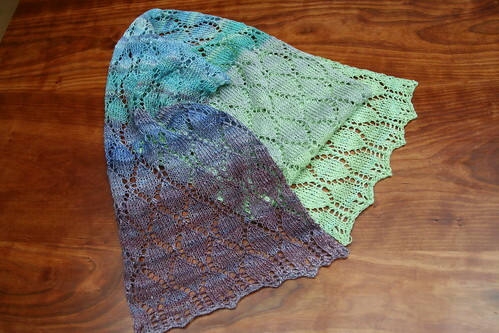 When I posted the picture of this yarn on the Hello Yarn group Fiber Club thread a couple of weeks ago, and mentioned what I planned to knit, one of the responses used the word ethereal to described the predicted results. Yarn: my handspun, detailed here, approximately 400 yds/4 oz. Gauge: hunh? 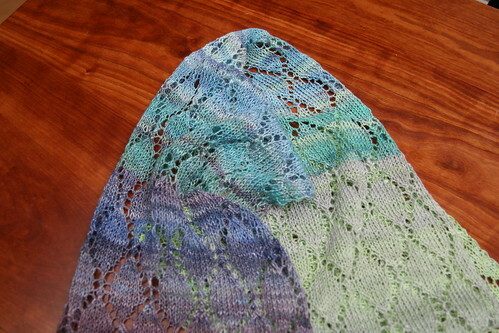 It's lace, the one time where gauge doesn't matter (much). Comments/mods: a lovely pattern, well written and easy to follow, that came out so well with this yarn that I think I will wear it for the rest of my days. 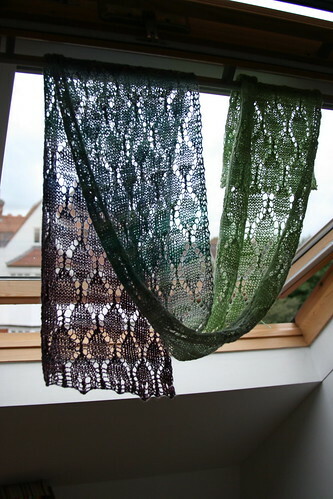 It's a lovely soft, drapey yarn that feels absolutely yummy knitted up. The color progression worked out better then I could have hoped, from purple to blues to teal to grey to green. I was expecting the green to be more overwhelming, since it seemed like I had way more green fiber then the other colors, but I don't think it looks too unbalanced. There were some spots in the yarn where some stray colors got mixed in, making odd stripes every so often. This bothered me while I was knitting, but isn't noticeable in the finished project. Win-win all around. Written by porpoise On July 27, 2009 In "Ply by Night", "handspun", "scarves"